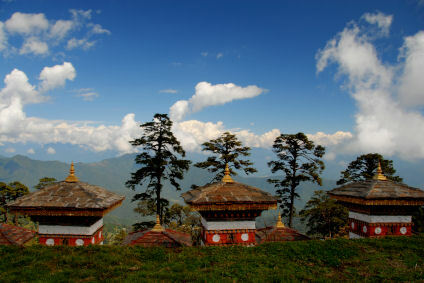 The history of Bhutan begins around 2000 BC when the Monpa migrated from Tibet. However, the first official recordings date back the the 7th century, with the arrival of Padmasambhava Guru Rinpoche, known as the second Buddha. He braught Buddhism to the kingdom and is deeply revered all over the country. Throughout the years he established several monasteries. 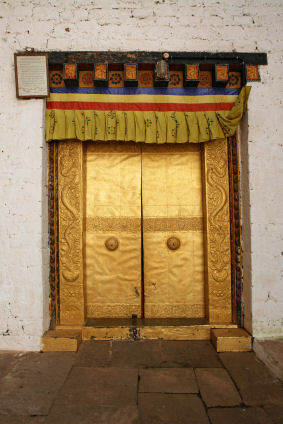 The system of creating and building dzongs was continued by Shabdrung Ngawang Namgyal. This Tibetan lama arrived in Bhutan in 1616 CE, introducing the still current dual system of secular and religious government. It is graced to Shabdrung that Bhutan was unified. After Shabdrung’s demise, for two centuries Bhutan was characterized by feuding regions with frequent civil wars. It was then when the regional penlops (governors) got more and more powerful. It was only in 1907 the country became more stable. Bhutan’s chiefs and principal lamas unanimously choose Ugyen Wangchuck as Bhutan's first king. Like Namgyal in his times, it was Wangchuck who again unified the country. This is the starting point of the Wangchuck dynasty, still consisting nowadays. The next four decades the monarchy directly controlled all of Bhutan, which was mostly isolated from the rest of the world. When China invaded Tibet, Bhutan wanted to avoid Tibet’s fate and strengthened its ties with India. It was in the 1960's when the kingdom abolished slavery and the caste system, undertaking social modernization and enacting land reform. One of Bhutan’s most important and revered kings – Jigme Singye Wangchuck who was coronated in 1974, started controlled development. He also put a strong emphasis on the preservation of Bhutan’s unique culture and environment. He wanted Bhutan to be economically self-reliant and introduced ‘Gross National Happiness’ to Bhutan and the world. It was also under his reign that Bhutan opened up for the world. In 1998 major political reforms were made in the kingdom. The Council of Ministers was dissolved by the king and the ministers who up till then were appointed by the Crown, had to be democratically elected. Bhutan experienced dark days in 1991 when 100.000 Nepali civil servants living in Bhutan, wanted more democracy. The Bhutanese government encouraged them to emigrate and even evicted many. Most of the Nepali living in Bhutan went back to Nepal. Nowadays they still live there in refugee camps, administered by the United Nations. They are still not allowedby the Bhutanese government to return. Democratic reforms continued and King Jigme Singye Wangchuck in 1998 voluntarily curtailed his absolute monarchy. In March 2005 a draft constitution was released, outlining plans to shift to a two-party democracy. In December 2006, the king abdicated in favor of his son, Jigme Khesar Namgyal Wangchuk. He still is Bhutan’s present ruler. Present prime minister is Jigme Thinley, belonging to the Bhutan Peace and Prosperity Party. March 2008 all the events eventually led to a shift from an absolute monarchy to a constitutional monarchy and parliamentary democracy, with its roots in the Tsa Thrim Chhenmo, a brand new supreme constitution which all citizens received in advance for opinion and feedback before it was radificated. 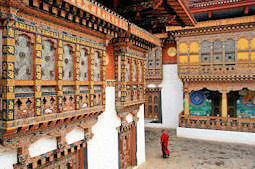 Based on the constitution, Bhutan has a parliament with two chambers. The king is head of state.